Cl₂/UV AOP treatment processes are highly complex and dependent on a number of water chemistry and treatment process parameters. With over three years of direct experience, MIOX is in a unique position to apply its expertise towards customer-specific optimization of Cl₂/UV AOP treatment processes with the goal of reducing costs and improving safety. 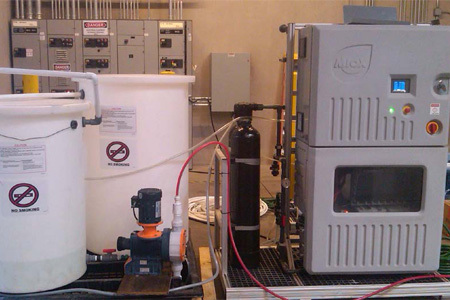 The use of MIOX’s On-Site generation systems, which produces aqueous chlorine from non-hazardous sodium chloride brine, offers a safer and superior chemical introduction into AOP treatment trains compared to concentrated hydrogen peroxide or bulk hypochlorite.